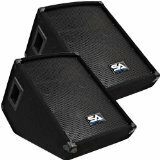 Pair of 10" Wedge Style Floor Monitors - Model - SA-10Mandnbsp; (Set of 2), 2-way 10" pro audio speaker with 40 ounce magnet and 2" voice coil, 100 watts RMS and 200 watts peak, 4x8 pies horn tweeter, two 1/4" inputs, Frequency Response: 45 to 20,000 Hz, Wired at 8 ohms, 95 db , Dual ports, 18 gauge full face steel grill, Black Metal Corners, Pocket Handles, 13.25" wide x 14" tall x 21" deep, Weight:andnbsp; 22 lbs per monitor, These monitors are brand new., One year warranty. This listing is for a pair of these monitors. Nabs; You will receive two monitors, pictured and described above. Nabs; Each monitor has the specs above. These monitors are great for vocals, PA systems, small DJ gigs, weddings, churches, and sound monitors. Nabs; These can be used on any setup for full band or drum monitors. Nabs; 10" monitors are ideal when you floor space is limited or your drummer needs a dedicated monitor and doesn't have much room. Nabs; These 10" monitors take up a very small foot print on your stage. Woofer - 10" 2 way crossover w/ a 40 oz magnet and 2" voice coil. 100 Watts RMS -200 Peak. Input terminal with two 1/4" inputs. Dual ports. These monitors are new. One year warranty.